Thanks Al! I wanted to get it all down while it was fresh in my mind to be honest. Speaking of which, I weighed EWC on our kitchen scales and it clocked in at 5.4 kg, so not as ludicrously underweight as we thought. Next time I'll ask to see the cal cert! See you, if not in March, definitely in May! I think that is approximately what he suggested, but given my low-to-middling understanding of RC systems my brain probably didn't store the complicated bits, all I remember is something about mixing and transmitters and better at steering, so thanks for the reminder! 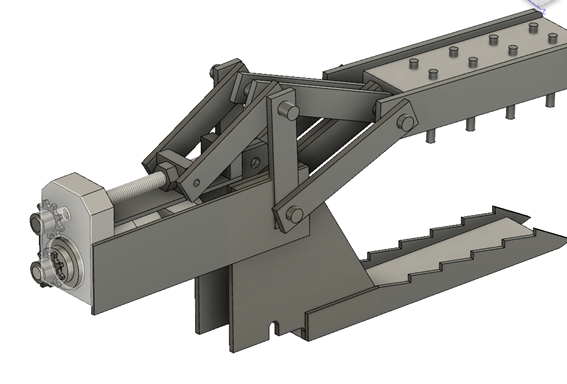 I had originally planned to make the front prong and grabber arm from steel, so that should add a kilo or thereabouts straight away, all be in front of the current CoG. It's all part of the learning experience! You'll eventually find where it is good on the transmitter for low speed manoeuvres, just requires practice (and looking at the transmitter as advised already). I found that The Honey Badger used to be very twitchy for ages until I got used to how to drive it through all its... um... "characterfulness". It was quite fast. I was very impressed seeing this machine at Robodojo, and I'm delighted to see such a detailed build log and event report, especially from another new team. I look forward to see what you do with the design moving forward, and it was lovely to meet you all at the event, there's definitely potential from your team! Thanks Eoin! Was great to meet you and your Dad too. I've got lots of ideas for modifications to the current robot and/or completely new designs... it'll be interesting to see what actually happens without a looming deadline though. Yeah, just getting used to it was a big part I think. Just watching the other two trying before me made a huge difference. 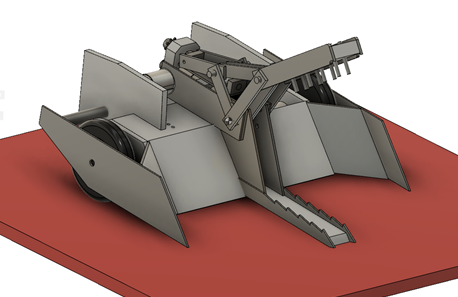 Predictably progress has been slow since the last post, thought we're still hoping to be ready with an improved Wedgeley for the May Robodojo FW event. There are two main jobs to do to make the robot a bit less ineffective. The first is to modify the weapon so it is actually capable of grabbing things and doesn't break when other robots hit it. The second is to make the drive system less vulnerable, which means better motor mounts, better wheel fixing and guards over the wheels. The bonus jobs on top of those are a srimech (primarily for the singing opportunities) and general tweaking of the internal/external layout. The trickier part is getting the jaw to move. The motor we used originally turned too fast (30 RPM), was probably too feeble to effectively grab anything, and also broke after a single hit. So just replacing that isn’t going to work. The easiest way to do what we’re trying to do is probably a linac, but the problem there is that most off-the-shelf linacs are pretty long (as in, when retracted). We’d probably want about 100-150 mm of stroke but that means a 250-300 mm long linac. That wouldn’t fit into the robot as it is and I don’t think we’re ready for a ground-up rebuild just yet. 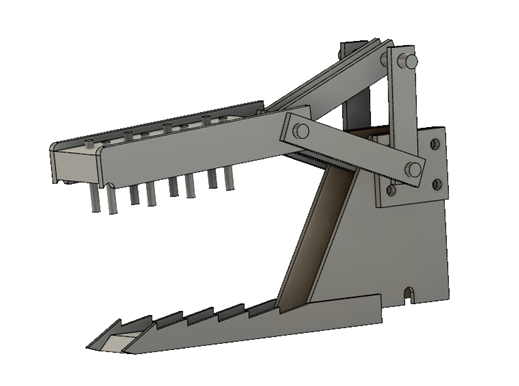 The alternative I’m thinking of is to actuate the jaw with a third drill motor. That should be reasonably cheap and means we only need one type of spare motor to cover us when things inevitably break. We could either great the drill motor down even further and then chain/gear drive the weapon, or use the motor to drive a leadscrew, i.e., make our own linac. The latter option seems a bit out of my comfort zone, but I’m also feeling like there would be a ridiculous amount of gearing required to get the 700-1000 RPM gearmotor turning the jaw at less than 10 RPM if we used a direct drive. My current thinking for the leadscrew option was to have the motor and screw fixed down, with a pivoting conrod attached to the lead nut. But this is more for the sake of having something in the CAD model. In terms of actual progress... the drill motor with unremovable chuck has finally been liberated! I stripped down the gearbox from the motor side, and found that an 11/16" socket fits perfectly over the 3 axles in the final stage to the output shaft. It was then fairly straightforward and wrench it free with a molegrip on the chuck. I guess this is a slightly risky manoeuvre - feels like there's a risk of bending the axles but it was that or chuck (haha) the whole thing in the bin. A small victory, but a victory nonetheless. I also got hold of some left-handed socket cap M5s from eBay to replace the ones that came in the drills - they were a bit too short and the countersuck heads were helping NO ONE. Hopefully we’ll have some more material updates soon... if anyone has any super weapon actuating ideas, then do please shout! Cheers all. Looks good. Regarding your actuator dilemma, have you looked at the GLA200 from Gimson? https://gimsonrobotics.co.uk/categor...inear-actuator It's only a little over 100mm long when retracted so with a 100mm stroke would be a little over 200mm. I use one on my bot Neophyte which has a grabber configuration & although you won't be crushing anything it does have enough force to keep a hold of bots. They also do the GLA750 version which is a little slower but has much more force behind it. Unless I'm misunderstanding the drawing on the Gimson website, that actuator is [stroke length plus 105] mm long when retracted. That means 205 mm for a 100 mm stroke, or 305 when extended, which is still a bit on the long side to fit. We could probably bodge it in somehow but it feels... suboptimal. Personally, I think the method you suggested would work as per the CAD diagram you posted You'd want a multi-stage spur gearbox to make it work rather than a planetary if horiztonal space is an issue. That is correct, 205mm for a 100mm stroke. 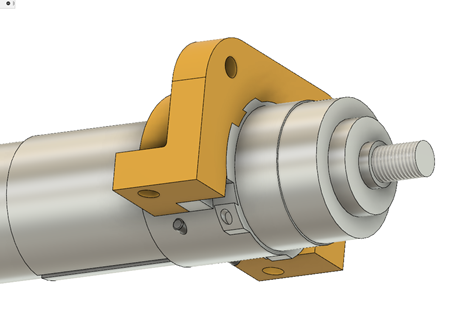 However the actuator will stop itself if it is unable to move to it's maximum extension, so you wouldn't need to worry about making the full 305mm fit. Alternatively if it's the body that's too big, you could get an actuator with a smaller stroke & attach an extra piece to the mechanism to make up the rest of the distance. Unless I'm missing something, there's no stopping mechanism in the actuators apart from the limit switches at the end. So if the actuator is not at the end of its travel and power is still applied, the actuator will try to force itself onwards, possibly damaging itself and/or the robot.